A couple of trips to small museums in Maine yielded two nice boats: a bark canoe and a skin-of-frame kayak. 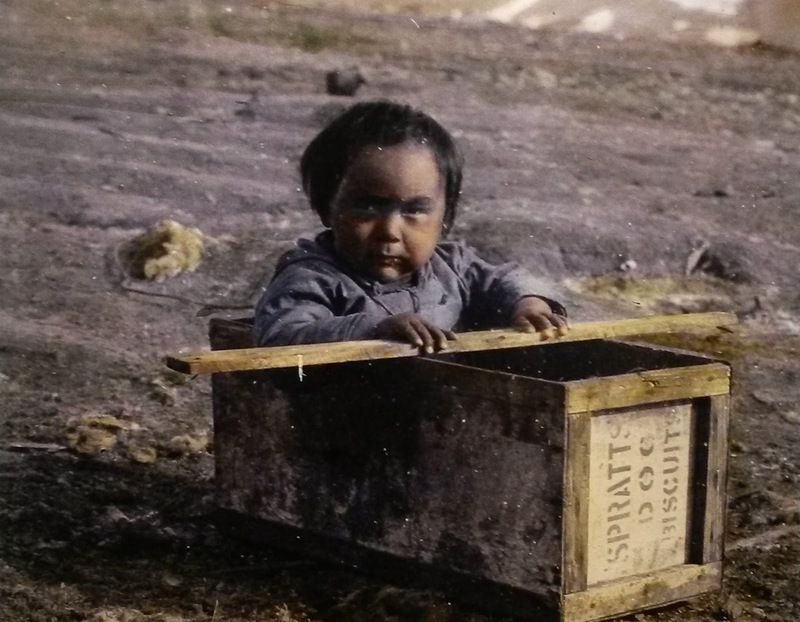 It's almost like a snapshot from Adney and Chapelle's The Bark Canoes and Skin Boats of North America. 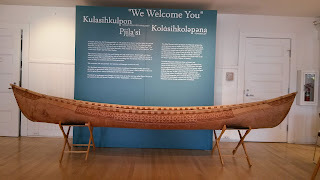 The canoe, at the Abbe Museum in Bar Harbor, is a fine reproduction. (We've written before about the Abbe Museum.) The kayak, at the Peary-MacMillan Arctic Museum at Bowdoin College, in Brunswick, is an authentic artifact. 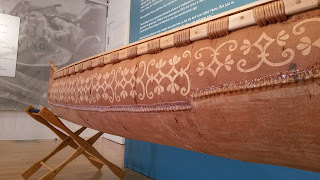 The bark along the sides of the canoe is etched in traditional patterns. Bark is harvested in winter to obtain the brown color that can be scraped away to reveal the lighter color underneath. 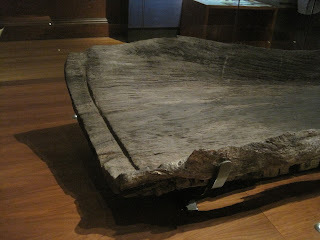 Seams between sections of bark are sewn with spruce root and sealed with pine resin. Inner and outer gunwales are lashed together with split spruce roots and pegged. A gunwale cap is also pegged in place. The thwart is mortised into the inner gunwale (i.e., inwale) and lashed. 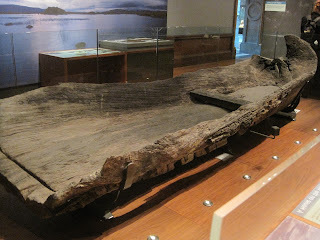 The bow has an etched flap of bark held against the hull by the outer gunwale. It's known by the Passamaquoddy term for "diaper" and it is purely decorative. 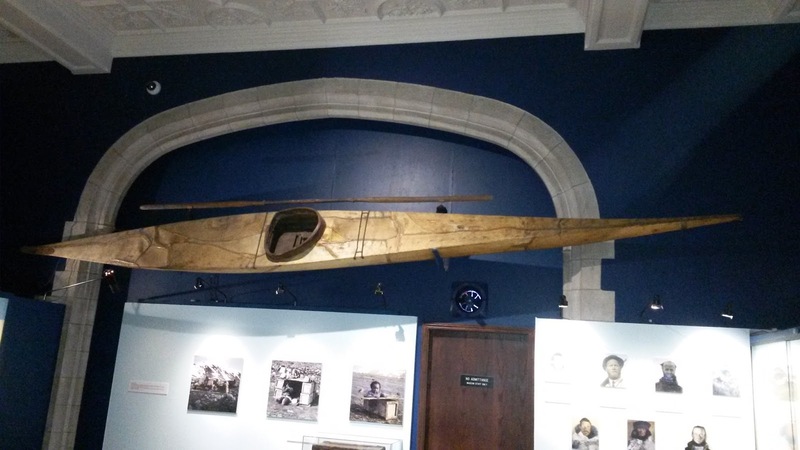 At the Peary-MacMillan Museum: a kayak of Labrador Inuit design, built between 1860 and 1890. The very flat deck rises just a bit in front of the cockpit rim to make it easier to enter the kayak. 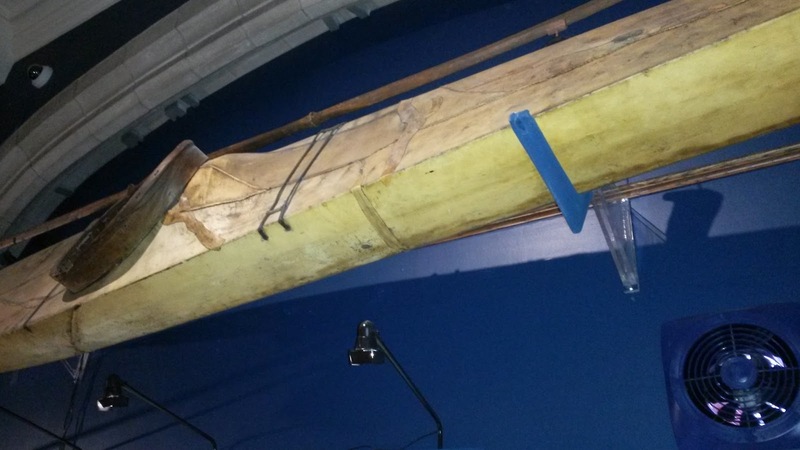 Built to fit its paddler specifically, the kayak would still have been a tight fit. One can see the chine timber and one intermediate longitudinal member between it and the sheer timber (which is not visible). The kayak has minimal deck rigging. The paddle just above the kayak is extremely long, and the blades are especially narrow. 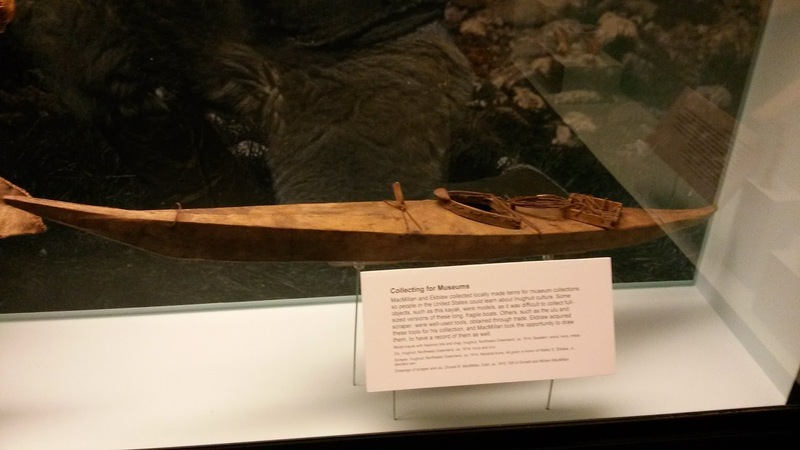 A model kayak just below the real one, built around 1914 by an Inuit for the MacMillan expedition's collection. The model has more elaborate deck rigging than the real kayak and a different shape cockpit rim. On the after deck is a harpoon line and drag. 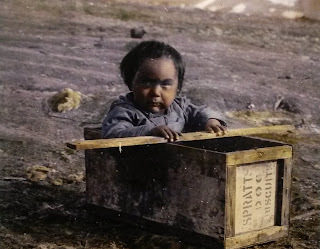 An Inuit child using an empty packing crate ("Spratt's dog biscuits") as a toy kayak, 1913. This logboat was discovered in 1960 near the shore of Loch Glashan in Argyll, Scotland, and the boat led to the discovery in the lake of a nearby crannog -- an artificial island settlement. (This one was from the 6-8th centuries.) 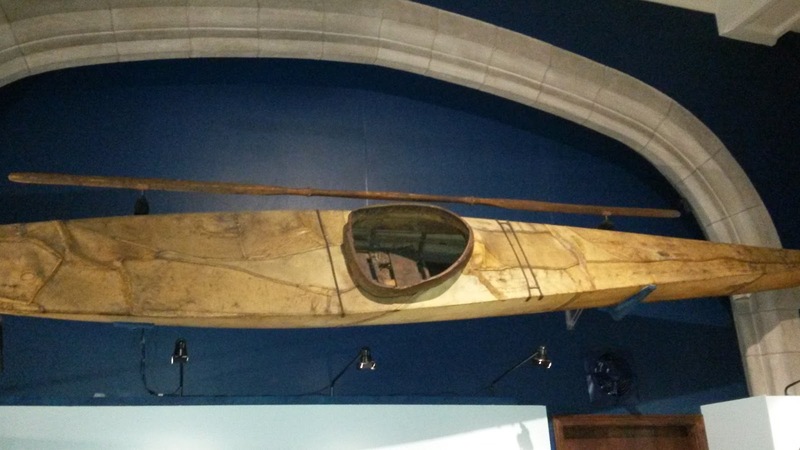 The boat is on display at the Kelvingrove Art Gallery and Museum in Glasgow. 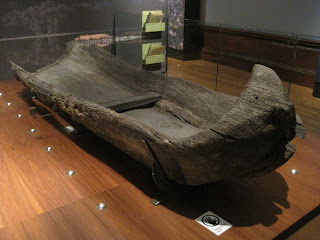 The boat hasn't been well dated, and it's thought to date from the 1st through 10th centuries. 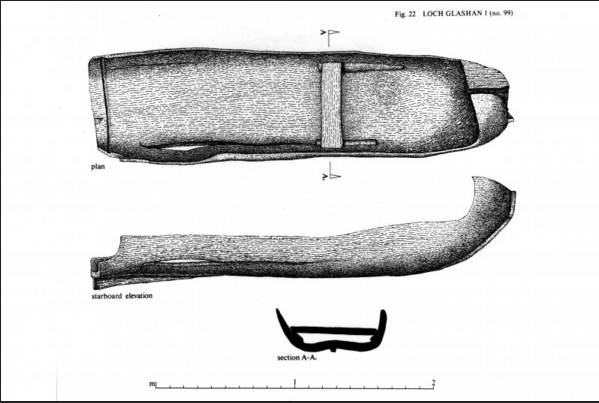 A paddle found nearby -- which might or might not have been associated with the boat, has been dated to the 6th to 9th century. The boat measures about 3.15 meters long and a bit under 0.8 meters in breadth. It possesses some interesting features for such a basic vessel. Even considering that the sides have sagged downward, the bow is still very high relative to the height of the gunwales. (There is no evidence for the use of of additional planks that would have raised the sides.) If its height was intended to keep water out of the boat in a heavy chop, it would have been necessary to keep the boat head-on to the waves at all times. A sitting thwart is supported on cleats left standing proud when the hull was hollowed out. It's quite low to keep the center of balance low. 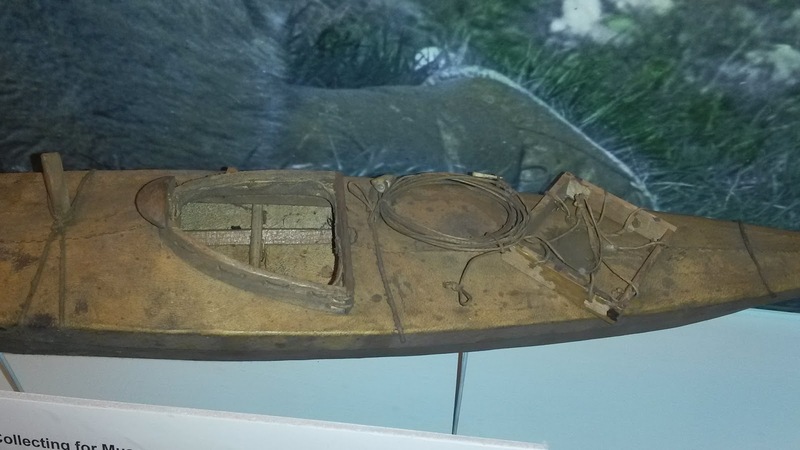 The stern was enclosed with a plank transom that fit into a slot that's let into the hull a couple inches forward of the extreme aft end. 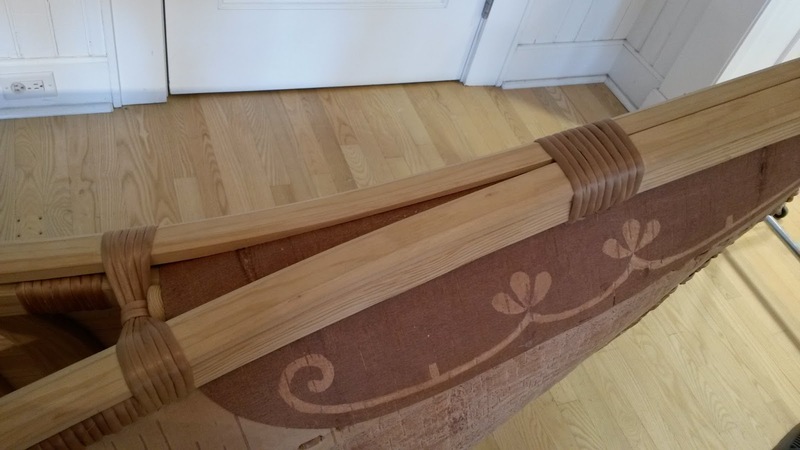 The transom plank (or planks) was considerably thinner than the hull. Some kind of caulking was probably used, possibly moss or some natural fiber. The thwart-support cleats and false stem and keel can be seen in the section view. 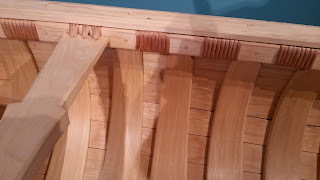 The upward bend of the bottom in the middle (in section view) is almost certainly due to deformation while the boat sat on its false keel, not the original shape. The sitting thwart is rather far forward for a solo paddler. Photos by the blogger, except the final one, which is sourced with a link. The illustration is from the Kelvingrove Museum.